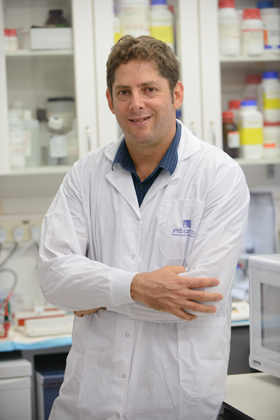 The trillions of microbial inhabitants in our gut determine how our bodies react to everything we ingest, says this Israeli scientist. Interview by Devika G. Bansal. Foods aren’t good or bad—they’re good or bad for you. That’s the message immunologist Eran Elinav has for a world obsessed with organic kale, non-fat yogurt and sugar-free ice cream. Elinav, who works at the Weizmann Institute of Israel, has spent close to a decade peering into the human gut, a playground teeming with the microscopic creatures that we now know to populate the body in the trillions. Among his most interesting discoveries is the finding that the same food can affect people’s metabolism differently depending on the microbial residents in their gut. Elinav’s recent work includes the Personalized Nutrition Project, a crowd-sourced online study to understand how our gut flora impacts the way we respond to different foods. His team tracked blood glucose levels, physical activity and changes in gut microbes of 800 people as they ate a variety of real-world meals through a week. The team labeled foods that elicit an increase in blood glucose levels as “bad,” because a post-meal glucose spike is considered to be a risk factor for diabetes and obesity. The team hypothesized that an individual’s microbiome determines how the body processes food, thus affecting the level of blood glucose that he or she derives from it after eating. Elinav and his colleagues collected enough data to build an algorithm that can now predict an individual’s blood sugar responses simply by knowing what microbes live in his or her gut. The findings have led to striking results. One of the project’s volunteers found that ice cream was just fine for her, but a tomato was not: ice cream didn't cause her blood glucose to spike, but tomatoes did. The team advised her to avoid tomatoes. Elinav’s latest research shows that organic handmade sourdough bread is not necessarily better than industrially made white bread. It all depends on what the microbes in our gut like to eat. Devika G. Bansal stole a few moments with Elinav on February 17 at the annual meeting of the American Association for the Advancement of Science in Boston for a chat about diets, microbes, and the state of the field. What pulled you into studying microbes? I started as a physician in gastroenterology where I was studying many diseases that have direct bearing on the microbiome. At some point, I developed a passion for science. Timing and luck are everything in life. I came from a field that is highly relevant for the microbiome and developed a passion for science right about the time when the field was born. How would you describe your work to your chatty neighbor who’s out to pick up the Sunday morning newspaper? I try to understand the fundamentals of the language by which our human side talks to the microbial side inside our body. We strongly believe that understanding this language would enable us to understand how the microbes in our body affect our physiology and how disruption in this communication leads to the risk of many diseases. Microbes are fascinating. What has been the most striking finding for you? I’m always fascinated by how surprising the results are for any big question we’ve asked. I would never have thought that if you take 1,000 people and give them an identical piece of white bread, each of them would react differently, despite the fact that bread has a standard glycemic index and caloric value. Each one of our big discoveries has started as a surprise because we were courageous enough to follow those questions. The Personalized Nutrition Project was very revealing of the way our gut microbes talk to our body. Is it still alive? Yes, yes, it’s very much alive. We’ve studied a little more than 1,000 people, but at one point we got to a waiting list of 10,000 people. If I wanted to know which foods spike my blood sugar levels, could I go and sign up to get a personalized diet for myself? So the Weizmann Institute has spun off the discoveries into a company that offers this as a service. It’s called DayTwo. You need to fill out questionnaires related to your background and medical conditions. Then they send you a kit so you can send a stool sample that they sequence very deeply, and then they use our algorithm to design a personalized set of recommendations for your diet. You mentioned in your talk that we shouldn’t use calories and glycemic indices to grade foods anymore because personalized diets will probably soon become the golden egg. If people start on a personalized diet, are you saying they shouldn’t have to worry as much about caloric intake? It’s not that if you don’t react to ice cream, we will tell you to have 10 kilos of ice cream a day. Calories do matter. Our algorithm gives you an answer that’s highly personalized based on your microbiome, but also takes care of diet and calorie content—because if you double your diet, you will gain weight regardless. I’m saying that just relying on calories and general recommendations has proven to be completely useless. I see. So personalized diets depend on our gut microbes that in turn depend on what we eat and where we live. The world is increasingly a place where people are moving globally. I, for example, grew up in India, moved to Singapore and now I’m here in the U.S. Every time we move, our food habits inevitably change. My question is how fast does your microbiome evolve according to your diet, and does that have an effect on health? Of course, it does. The microbiome changes from within days to weeks—it’s very rapid. Dietary interventions are very robustly changing your microbiome, and it changes your health in different contexts. For example, the very famous studies on Japanese people who immigrated to the western U.S. gave us the opportunity to compare Japanese people in Japan versus their family members that are now Americanized. You could see that those who are now in America developed this huge tendency toward obesity and diabetes while these conditions do not exist in their immediate relatives in Japan. This is all environmental, it’s occurring within one generation, and we believe that at least part of this is mediated through the changes exerted by diet on the microbiome. What about comfort foods? I’ve seen people often feel better when they eat foods they grew up with. Of course, the feel-good factor probably comes from taste and memory association, but is it possible there’s a microbiome answer to that as well? Maybe we digest those foods better? Maybe, it could be. But all of these potential truths need to be experimented and checked. When I travel to India, in many cases I will have changes in my bowel habits. This is because I encountered the Indian microbiome and it colonizes me. Through this process there are a lot of issues, right? But once the Indian microbiome takes over my microbiome after a few weeks I'm in India, then I'm an Indian as far as I'm concerned. "I would never have thought that if you take 1,000 people and give them an identical piece of white bread, each of them would react differently." So our microbiomes are sort of what make us Indian or Israeli or American. [Laughs] Well, it’s not just the microbiome, but it’s not a small part, I can tell you that. Keeping that in mind, are you looking at microbiomes for different ethnic groups? Yes, we do that extensively now. We’re following up the personalized diet project in the U.S. now with the Mayo Clinic. It’s a large-scale study, which is basically a copy of the Personalized Nutrition Project, testing the same exact methods in an American population. We're planning to do the same with Chinese populations and maybe Indian populations because although the concept is generalizable to everyone, we believe we need to do it with each population because each diet would necessitate some tweaking of the algorithm. What is the most pressing issue in microbiome research right now? The biggest challenge this field is facing is to move from associations and correlations into causations. Rather than describing changes in the microbiome in different contexts and diseases, we’re now at a point where the field is craving to prove that some functions of the microbes are actually driving disease or contributing to disease. This shift from association to causality is the biggest challenge of the field. Most of my lab is deep into trying to develop new methods to try and prove what microbes are doing and how it affects the host. I think this would enable us to really pinpoint the important disease-causing junctions rather than just to see this ocean of changes, most of which are secondary and less important. So once we are able to say that lack of microbe A causes disease X, we can intervene by supplying the microbe. Let’s say a person changes his or her diet and gains weight, and you measure their gut microbiome every day. You will see major changes. Now you have no idea which of these changes is the cause of the changes in diet. But most of these changes in the microbiome are results of the weight gain. They are passenger effects, which are less interesting. But a small percentage of these changes are actually driving the obesity. Now if we have a robust way of proving causation, we will be able to understand which microbes [drive] obesity and which don’t care. And once you have that, you could then intervene. Yes, by using pre-biotics, probiotics, post-biotics. So probiotics would be eating bacteria directly through yogurt, kimchi and kombucha. But what are pre-biotics and post-biotics? Bacteria are probiotics; giving nutritional supplements that selectively change the growth of bacteria are pre-biotics. Post-biotics is a term we coined and now it's becoming very prevalent in the field. Post-biotics are treatments that intervene in the products of the microbiome rather than the bacteria themselves. If you identify metabolites, or by-products secreted by bacteria, the lack of which contributes to disease, then when you give these metabolites, you bypass the need to understand which bacteria are secreting them. You bypass the differences in bacteria between individuals, and you just give the molecules that the bacteria actually produce. How can we make all these microbial discoveries relevant to the clinic? Everything is directed toward causation and toward understanding more of this language that dictates the communication channels between our microbes and us. Each letter of this alphabet that we decipher has a meaning, and each letter makes us realize that when it's missing, there's a risk to developing some condition. We don’t know in advance what could happen, but I would expect it would lead to more and more clinically relevant discoveries in the near future. © 2017 Devika G. Bansal. Devika cultures her writing at www.dgbansal.com.